Certified Organic and with a 75% protein content, this protein powder is a great option for those searching for a natural Organic Whey Protein, which is also soya free! 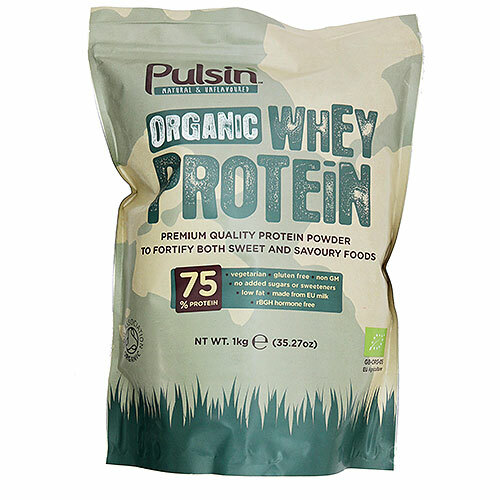 Pulsin make natural protein bars, protein powders and healthy treats that are as good for you as they taste. Packed full of natural ingredients and organic goodness, their products are free from nasties, high in protein and low in GI. A 10g serving (1 heaped dessertspoon) provides 7.5g of protein. Use 1-3 servings per day to fortify foods. Below are reviews of Pulsin Organic Whey Protein - 1kg by bodykind customers. If you have tried this product we'd love to hear what you think so please leave a review.